Considering the rainfall for October (77mm) and November (76mm) were very similar, the amount of Pb-210 detected for November 2015 was significantly greater than October. This suggests there was a lot more Radon-222 in the air here at Caloundra, during November. At the beginning of November and again on the 14th November, a 40%+ increase in day average backgrounds levels were detected at my location on the East Coast Of Australia, near Brisbane. Tests were conducted to try an establish the source of the elevated background. There were evening storms on the 14th, during one of these elevated background events, so a car rain swab was collected on the morning of the 15th November. The rain had been sitting on the car overnight. A scintillator test of it was started on the afternoon of the15th. It was tested for ~24 hours. Radon is formed in the normal radioactive decay of Thorium which produces Radon-220, and Uranium which produces Radon-222. Both of these different Radon isotopes decay slowly into lead. 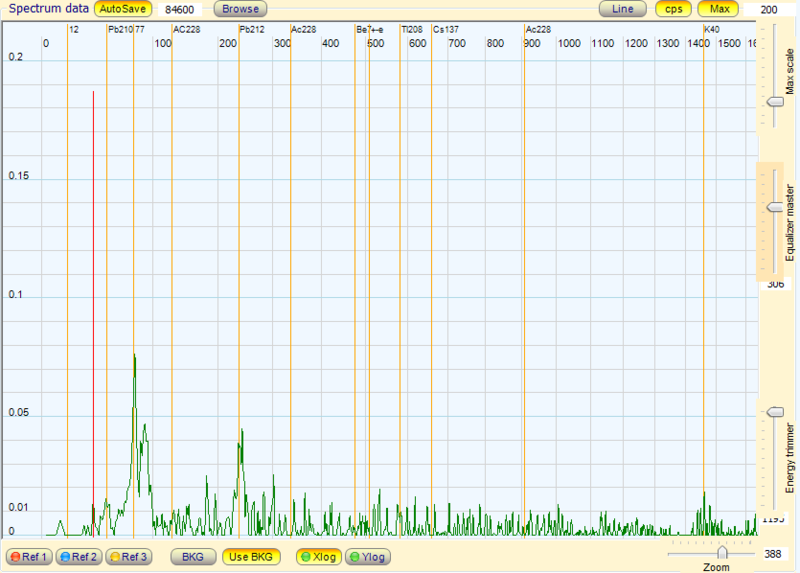 In the test chart you will see isotope maker peaks for Lead Pb-212 and an X-ray at 77 keV. These are decay daughters of Radon-220. 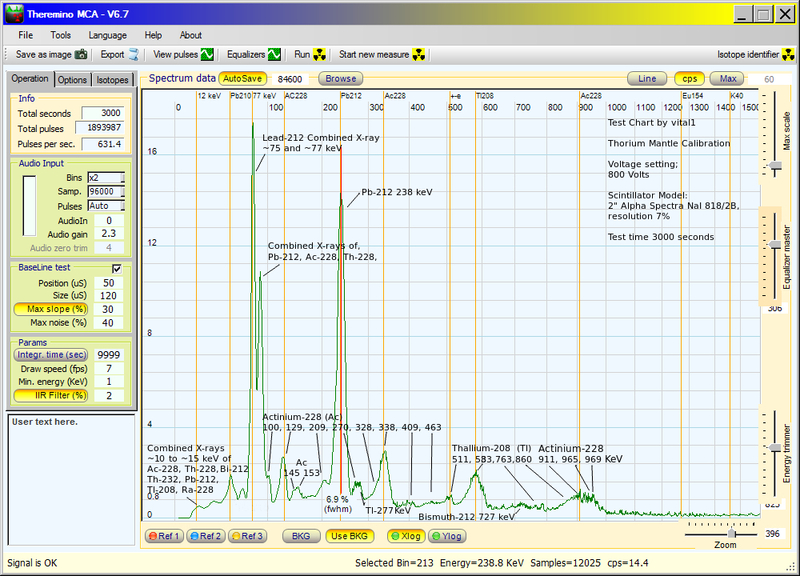 This suggests that Thorium-232 was the source. There are also traces of Lead Pb-210, and Potassium-40. Lead Pb-210 is the decay daughter of Radon-222. This means there was also some Radon-222 in the air at the time. The test detected trace amounts of Th-232 decay daughters, so the rain swab test chart only shows the tops of the main Th-232 decay daughter and X-ray peaks. 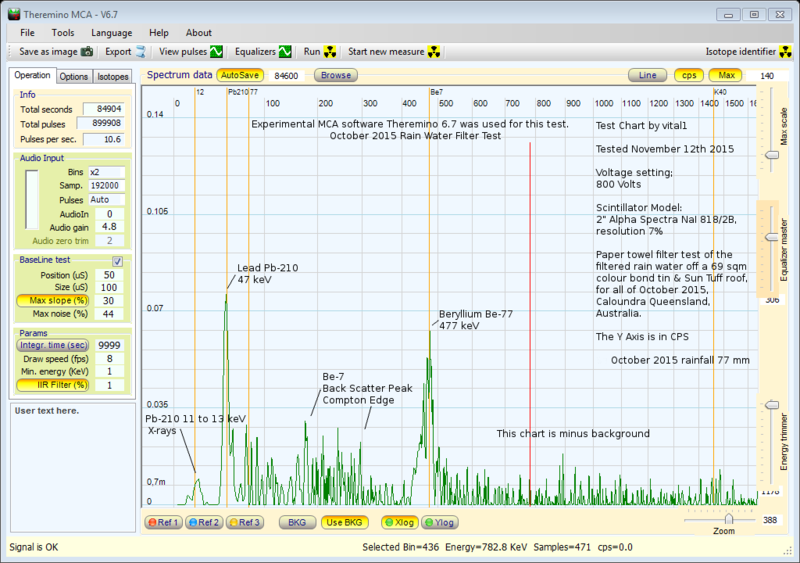 A Thorium gas mantle test shows the main Thorium Th-232 decay daughter peaks. I have provided it as a reference. As you can see from the gas mantel test, the equipment here can separate the combined X-ray daughter peak around 89/90 keV, from the main 77 KeV peak. November 15th Rain Swab Chart. Where is the Thorium-232 coming from? Sources of atmospheric releases of Thorium-232 could be the recent Indonesian, New Zealand or South American volcanic eruptions, or a mining operation somewhere? There is a lot of volcanic activity in the Southern Hemisphere at present. Because the elevated detections where detected along the entire Eastern Coast of Australia, by numerous private monitoring stations, I am leaning towards volcanic activity, rather than a mining operation. As you can see from the comparison chart below, Cairns had much more dynamic swings in background than Caloundra for November. Cairns is red in this chart and Caloundra is yellow. 1. The increased background we get every year in the warmer months, as a result of Fukushima equatorial breakthrough. 2. An increase from recent Southern Hemisphere volcanic activity. The local November month average background radiation for November 2014, 2013, and 2012, works out to 0.130 uSv. The volcanic activity, or whatever source created the recent increase, appears to have increased the November 2015 month average local background to 0.137 uSv. These measurements are recorded by a GammaScout Alert Geiger counter, logging every 60 seconds. The data is downloaded and turned into a day average chart, and eventually a month average chart. Here are month day average charts for November 2015, 2014, 2013, and 2012, local background radiation levels. 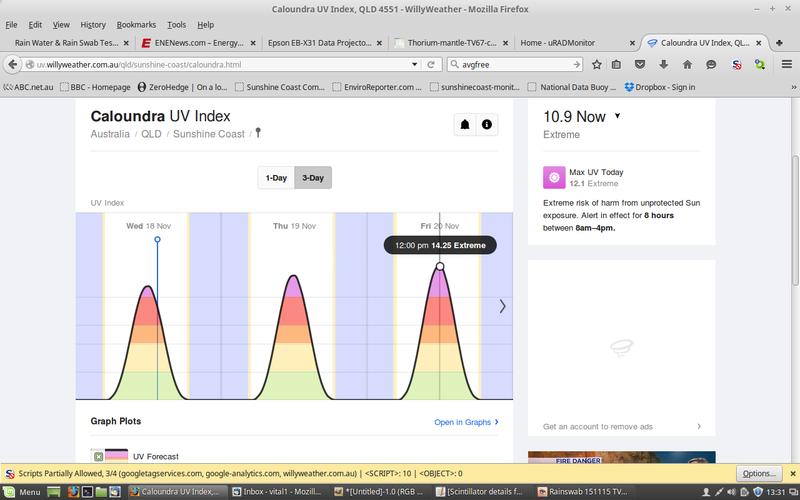 Extreme UV levels here in Australia at present. I suggest monitoring your local UV levels, as well as local radiation background now. Why are UV levels going so high? The article below has a possible explanation. You will also find links to country based UV monitoring stations in this article. 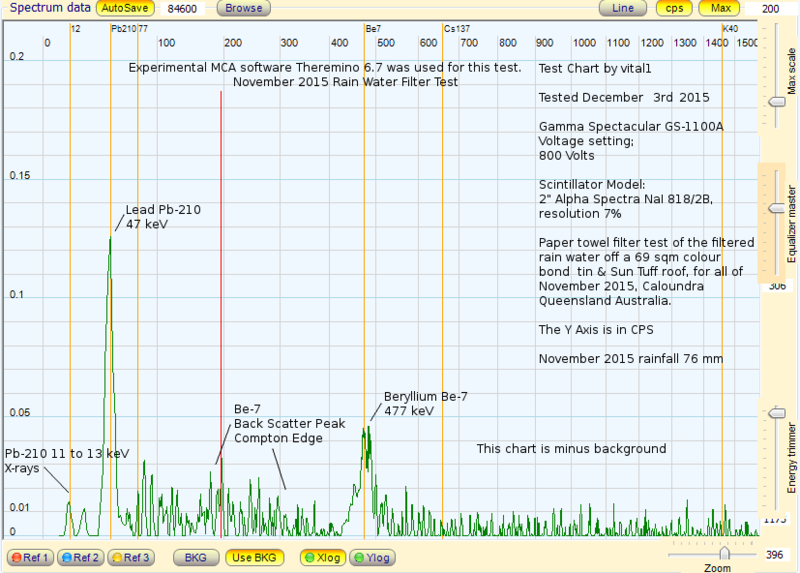 Caloundra Early November 2015 Rain Water Test Report – At the beginning of November and again on the 14th November, elevated backgrounds levels were detected at my location on the East Coast of Australia, near Brisbane. Tests were conducted to try an establish the source of the elevated background. If it was from Fukushima, I would expect to see other Fukushima isotope markers present. Sources of atmospheric releases of Radon-220 could be the recent Indonesian, New Zealand or South American volcanic eruptions, or a mining operation somewhere? There is a lot of volcanic activity in the Southern Hemisphere at present. On the Emergency and Disaster Information Service map, you can see the locations of erupting volcanoes in South America, New Zealand and Indonesia. Because the elevated detections where detected along the entire Eastern Coast of Australia, by numerous private monitoring stations, I am leaning towards volcanic activity, rather than a mining operation. Southern Hemisphere October 2015 Rain Water Test Report. As usual, Lead Pb-210 and Beryllium Be-7 were the main isotopes detected in the rainwater filter. Rainfall for October was 77 mm.